Tent, yurts and cabins for rent. Safari tents, yurts and cabins have decks with furniture and table, grills. Heat/air in yurts and air conditioning and fireplaces. No Smoking in any rentals. This is our number one RV Park. We toured New England for five weeks this fall & were most impressed with this park. Very clean, well maintained, roomy sites, conveniently located. We plan to return next fall. 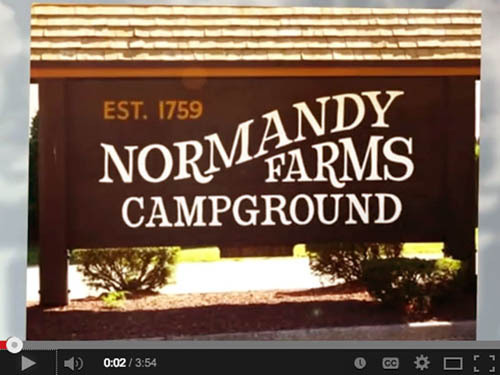 We highly recommend Normandy Farms! Most peaceful RV park I have ever been to. Quiet at night. Perfectly level site and the nicest staff I have ever encountered both on the phone and in person. I did not want to leave! This park has everything you can imagine, four swimming pools, tennis courts, frisbee golf, soccer field, arcade, TV room, hot tubs and the staff truly go out of their way to answer all inquiries and help in any way they can. Our lot was large and flat making set up a breeze. And I loved the way the spaces were staggered to give you the maximum privacy. The landscaping is amazing all over the park. I cannot imagine anyone being disappointed with their stay at this lovely park. We had a wonderful stay at this resort. It's a destination unto itself. With activities galore, the kids will have plenty to do. The site was the largest I have parked in, ever! The resort was a fairly convenient jumping off spot for us to explore Boston and Plymouth. Staff was great and facility was wonderful. I would definitely stay here again. Wow! This place is incredible. There are more amenities here than in most all-inclusive resorts. There are four pools, a kitchen (only open on weekends), an adult loft (pool table, books, tv's, puzzles, chess boards, etc., a kids loft, frisbee golf, softball, shuffleboard, a spa, an enormous store, and more. There are 100's of sites here, all nestled in the trees. It costs more than most parks but if you use the facilities, it is well worth it. And, the staff are fantastic. Great place - check it out! An absolute gem! This was our second visit to this campground. We were way in the back of the campground in a very quiet part of the campground. The hook ups and easy to get to. 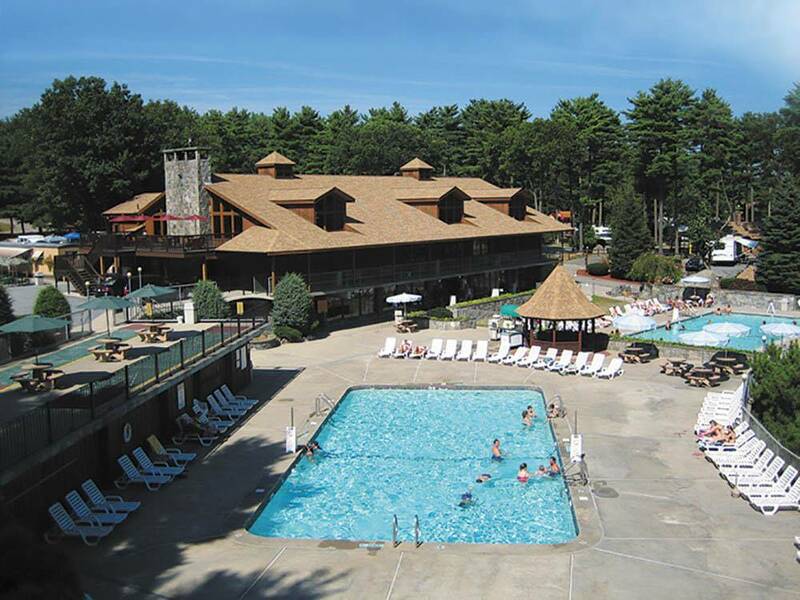 The amenities are spectacular and the staff were very friendly. My only minor complaint is that they need to put a speed bump at the bottom of the hill near our site. Vehicles travelled pretty fast as they came down the hill. We will look to stay here again in the future! Best Campground I have ever been to. Grounds are beatiful, Bathrooms are immaculate and the staff is fantastic. Only drawback is that there are not many trees. This is a beautiful campground within a half mile of hiking the trails of a state forest. We stayed in a full-hook-up site and, because it was during Thanksgiving, were placed near the water spigot so we did not have to move our Class C. We would stay here again. Normandy Farms is probably the best family park we have ever been camping. It is huge, spread over rolling hills with all types of campsites. We stayed in mid October and it was the their first "Halloween Family Weekend" with prizes for best adult costumes, kids costumes, decorated site, etc. They had bingo, a haunted house, games, scary movies, etc. 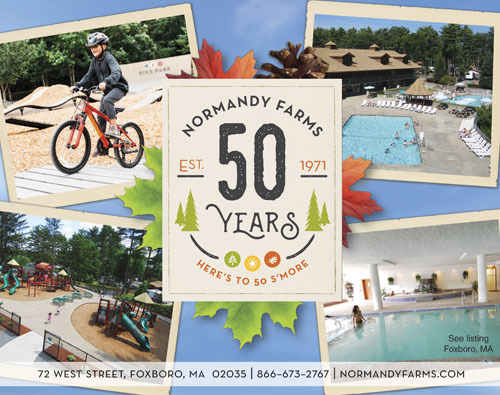 Amenities were endless and included an elaborate bike ramp park, soccer field, two softball fields, 18-hole Frisbee golf, pool, fishing pond and playgrounds. The sites were good size, fairly level and contained two sewer hook-ups, one at the rear of the site and one in the center; very nice. The camp office is manned by four individuals and is open from 9:00AM - 9:00PM. Staff members seemed to be easy to find, very helpful and cordial. The bathrooms were extremely clean with a step down into the shower. All water stayed in the shower and you stepped up to the dry space to dress. The paper handout given with map of the campground was very thorough with lists of local businesses (barber, hospitals, car repair, dining, delivery or takeout, etc). We planned a few trips into Boston from the campground. There is a commuter train just 10 minutes away in Mansfield. There are also subway stations: Quincy Adams Station and Riverside about 30 minutes drive. We used Quincy Adams over the weekend since traffic would be lighter but on weekdays we used the Mansfield commuter train. This was the fastest option but parking is a real challenge here and very confusing with poor signage. Allow extra time for your first trip so you can figure out parking and walk to the station. There will be steps to negotiate unless you have a handicap placard. We would definitely stay here again if in the Boston area. Always a great stay that is close to home. Great sites (probably 100' long). Neighbors are close but not too close. Most sites are full hook up now. We stayed in the 1000 row and the park cable worked well, but our satellite did not work at all (row of heavy woods right behind those sites). WiFi is terrible (Tenigo) for speed - even purchased session "premium" was very very slow just loading basic web sites. Pools are great and the indoor pool and hot tub came in handy. Relax & enjoy the unique seasons of New England in your RV or tent. Try our deluxe cabins, YURTs, pop-up trailers or safari tents for those seeking an elevated camping experience. Your family is sure to have a memorable time.